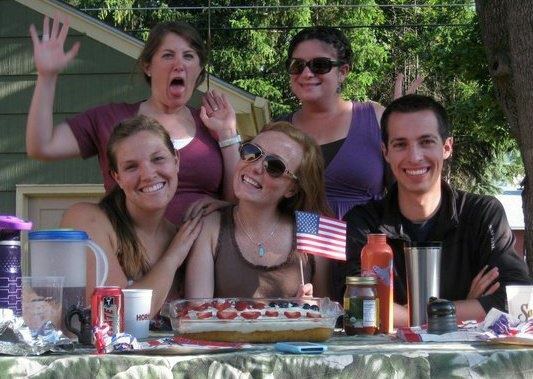 Jen Certa served as Jesuit Volunteer in Missoula, MT for two years, from 2009-2011. After her term of service, Jen was hired by her placement and continues to work at the YWCA as a Children’s Advocate. 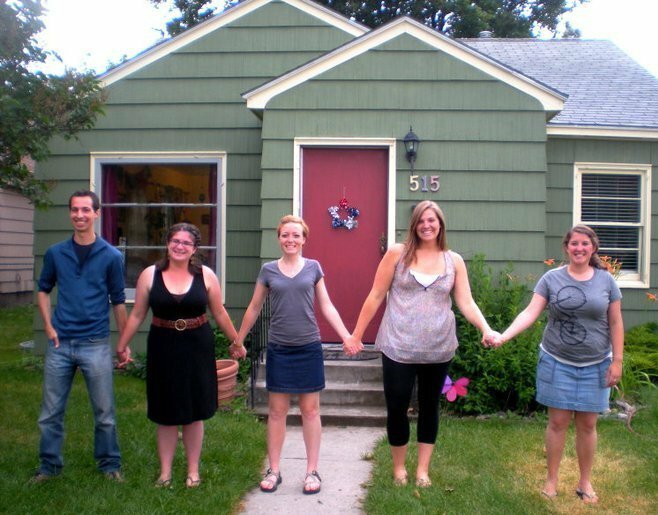 Outside their Happy Home, the 2010-2011 Missoula, MT community. The truth is, I have been an FJV since the end of July 2011, and I still wasn’t exactly sure how to answer that question. Lately, the indicator for me that I have been “ruined” by my years as a JV is how fervently I miss living in intentional community. These days, I think of my community often, in odd moments – when Dispatch’s song “Elias” plays in my car, while reaching for the tater-tots in the frozen food section of the Orange Street Food Farm, when I see the bison herd outside Missoula and have to resist the urge to shout “BOOFALO!,” because no one but Lindsay, Meggie, Jon, and Janna would understand. I knew I would miss my housemates as individuals. But I was not prepared for how much I would actually miss our life as a community. Our community in Missoula had some amazing times, for sure, but we had our rough patches too; times when our little green house felt especially small. If someone had paid me a nickel every time I said some variation of, “Why did I sign up for this again?” last year, I would have had – well, let’s just say it would have considerably increased my monthly stipend. Since I earned my FJV wings, though, community is the value I miss the most. Perhaps it’s because I think of myself as still actively trying to live out the other values: working for social justice, exploring my spiritual life, trying to live simply and practice sustainability. It’s just that now the journey feels slightly more individual, and dare I say, lonely. Now, I live with a roommate, but hardly see her. Instead of community “energy fasts” and challenging ourselves to sleep on the floor together, I find my own ways to keep exploring the values. I try to rope coworkers, friends, and family into doing this with me (currently I’m working on trying to get my family to compost. Hi Mom!). Sometimes I suspect they think I’m one bagel short of a baker’s dozen. When that happens, I find comfort in the company and understanding of other FJVs. What it comes down to is that living in intentional community has changed – and ruined – my life, for the better. Each of my community members contributed to my gradual realization that social justice was not simply connected to the marginalized people we served in the shelters and mental health facilities of Missoula, or to the compost pile we cultivated in our backyard. It was connected to our relationships with one another. In our little green house, I grew in my understanding of peace and justice as I was both challenged, and nurtured, by my housemates… To be more accepting of myself and others. To communicate with people with different worldviews and kitchen habits from my own. To be more considerate, flexible, honest, compassionate. To own my mistakes and flaws. To celebrate small victories. To stand by my beliefs. To be more open. To move outside the bounds of my comfort zone. To be willing to take risks. To think and feel more deeply. To do things differently. To practice loving kindness. To see our common humanity. To keep fighting the good fight. I am ruined, and I am grateful. A Summer Meal with the 2010-2011 Missoula, MT JV Community.